Program participants received backpacks and a standing ovation at the end of the celebration. A new public-private partnership is helping address our region’s growing need for medical assistants, while at the same time connecting low-income community members, people of color, and first-generation college students with living-wage careers. On September 7, representatives from the City of Seattle, Seattle Colleges and Kaiser Permanente gathered with students at the Pacific Tower to celebrate the first year of the Kaiser Permanente Medical Assistant Career Launch Scholarship program. The program provides comprehensive, wrap-around scholarships for 18 students to attend the Seattle Colleges’ Vocational Institute Medical Assisting certificate program. The Seattle Office of Economic Development supports this partnership through its investment in the Seattle Colleges Center for Working Adults, which manages the partnership and coordinates program success. Mayor Durkan addressing the students and their families. “Nothing is more critical to providing great health care than great health care workers. By teaming up with the Seattle Colleges to support these Medical Assistant students, we’re investing in the future of excellent care in our region,” said Susan Mullaney, President of Kaiser Permanente Washington. Medical assisting is one of the fastest-growing occupations both nationally and locally. According to Emsi data, the demand for medical assistants is projected to grow 23 percent by 2022 in King County. Job training partnerships between employers and educational institutions have been shown to benefit students, educators, and employers, and help ensure that employers are able to find skilled workers to fill in-demand positions. Medical assistants perform important services such immunizations and blood draws, and investing in their training is beneficial for the entire community. A recent study from Kaiser Permanente Washington Health Research Institute (KPWHRI) found evidence that investing in additional training for medical assistants and expanding their role in a patient’s healthcare can improve outcomes for the chronically ill.
Students, ranging in age from 18 to over 45, took pre-requisite courses this summer in preparation for beginning the medical assistant program this fall. The program includes professional development from Kaiser Permanente medical assistants, tutoring, one-on-one support from a Navigator from the Seattle Colleges’ Center for Working Adults, and wrap-around support in partnership with the Seattle Jobs Initiative and multiple community-based organizations. The Kaiser Permanente Scholarship eliminates the financial barrier that may have otherwise prevented its students accessing the training they need to pursue this high-demand, living-wage career. Students will take part in a hands-on externship in a clinic during their final quarter, in partnership with a variety of healthcare employers. In addition to professional development, students will participate in team building, mindfulness workshops, and financial coaching, further supporting them for long-term success. On April 6, 2018, the Trump administration rolled out a new “zero tolerance policy” mandating that all individuals who illegally enter the United States must be prosecuted. Although calling for prosecution of undocumented border crossings is not new, the administration’s inhumane practice of forced family separation represents an extreme shift in this country’s treatment of immigrants, who are often fleeing to the United States to seek refuge. America’s economy has long been built by immigrants, and those coming from the Mexican border have a hand in shaping every industry Washington proudly boasts, from aerospace to tech to entrepreneurship to the state’s multi-billion-dollar agriculture industry, which flows through Seattle’s ports daily. Contrary to a commonly-perpetuated myth, immigrants do not negatively impact the economy that is taking them in. In fact, Washington immigrants alone contributed $815 million to Medicare and $3 billion to Social Security in 2014. Those who arrive in America are here to work. Mexican immigrants show a higher labor force participation rate (69%) than the native-born population (62%). Immigrants play an important role throughout our entire economy— immigrants make up 18 percent of all entrepreneurs in Washington State. However, this article will focus on the impact of migrant workers on our state-wide agricultural industry. The United States relies on people immigrating from Mexico in every sector of the economy, particularly in our state’s agricultural sector. 40.4% of all workers in the agricultural, farming, fishing, and forestry industries are immigrants. For workers, an average day in Washington’s many orchards and farms can start as early as 5 A.M., with the most common minimum yield of three to four bins of apples (four bins for Red Delicious, three bins for every other apple variety), 420 pounds of cherries, 152 pounds of blueberries, or four bins of pears per day, depending on which fruit is in season. Washington’s international agricultural industry is dependent on securing a solid group of workers each agricultural season to pick, process, pack, and manage the produce that reaches global markets. However, the population of Mexican-born immigrants in the U.S. has been steadily decreasing since the peak population of 12.8 million in 2007. From 2009 to 2014, U.S. citizen labor has failed to maintain the workforce needed to keep farms at their highest profitable margins. Benton City, Wash. grower Shawn Gay lost one third of his Gala apples three years ago when the lack of labor meant his farm just simply ran out of time to complete the harvest. Auburn, Wash. farmer Rosella Mosby saw $100,000 of profit rot away due to a loss of more than 20% of their workforce. Like Gay and Mosby, many farmers are seeing that native U.S. born workers are not able to make up for the labor gap caused by a declining foreign-born workforce. Fruit goes unpicked which means farms are losing out on precious profits and putting their livelihoods, as well as Washington’s export economy at risk. We have too much to lose with a disappearing immigrant population. Washington State is the second largest food distributor in the U.S., which means that the ripple effects of a lesser supply of exports affects the entire world. Our state’s economy is built on the backs, hands, and feet of each migrant worker, who are constantly enduring the fear and worry that the administration has instilled. ICE raids and detention centers are terrorizing and destroying the immigrant communities that have, for years, done the heavy lifting to build this country. We need to be working to protect and build the migrant community, not tearing them down. Learn more about OED’s work to support Latinx and all small business owners in Seattle here, and understand resources available to immigrants of any background through the Office of Immigrant and Refugee Affairs, such as the free Legal Defense Network, free naturalization services and workshops, English as a Second Language job-readiness skills, and more. Business owner Jose Perez and his family members taking a break from work for a photo. Seattleites—especially Seattleites who moved here from Mexico or California—will often tell you how hard it is to find good Mexican food in the city, but you have to know where to look. Villa Escondida in Belltown, called “among city’s best Mexican” by the Seattle Times, is one of the only Mexican-owned Mexican restaurants in the downtown area. Villa Escondida is family-owned and family-run. 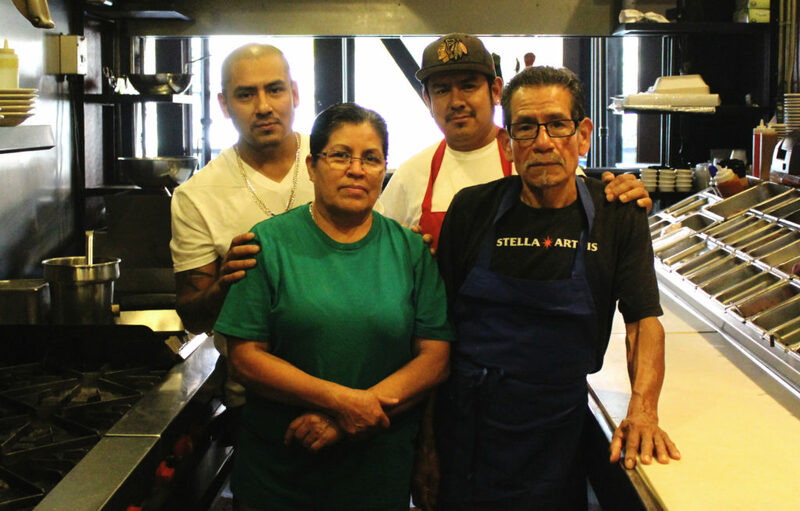 Owner Jose Perez first opened the restaurant on Capitol Hill with help from his cousin in 2014, before moving to the Belltown location three years ago. Family members including Jose’s wife and mother make up most of the staff at the restaurant, where pretty much everything on the menu is fresh and house-made. A poster made by Jose’s nephew for a school project hangs in the restaurant. The new Belltown location is a perfect spot for the restaurant—spacious, with a great street front patio—but the building came with its share of problems. 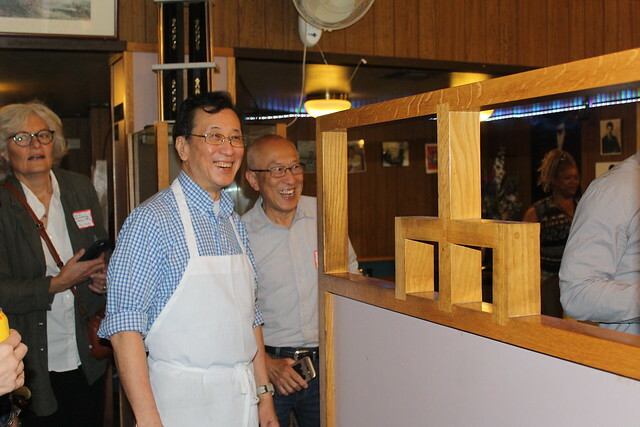 Jose has had to deal with ceiling leaks and other issues, which are inconvenient for any tenant, and especially destructive for a small business. Frustrated with constant problems, Jose was connected with the Office of Economic Development’s Lease Education Program. The program helps small business owners understand the terms of their commercial lease as well as their rights as a tenant. In Jose’s case, he also benefited from receiving these services in his first language of Spanish. You can find Villa Escondida, and meet Jose and his family, at 2203 1st Ave in Belltown. Follow them on Facebook to keep up with their happy hour deals and brunch specials too. Learn more about lease education and our other services for small businesses on our website, or reach out to us at oed@seattle.gov. Photo courtesy Cameron Karsten Photography for Seattle Colleges 2018 marketing campaign at Seattle Central College. Seattle is enjoying impressively low unemployment rates—the lowest point in 2018 so far was 2.8 percent in April. With so few workers to go around, how is an employer to fill open positions? The answer to that question, for many employers, is investing in workforce development—that is, making sure that prospective future employees are trained and prepared to fill in-demand positions. According to a new study from the National Skills Coalition, about 80 percent of jobs in the U.S. require candidates to have some form of training or education beyond high school. This doesn’t mean that most workers will be required to get a four-year degree to be successful. About 53 percent of jobs in our labor market are “middle skill,” meaning they require training beyond high school but not a college degree, according to the same study. However, only 43 percent of workers have the training they need to qualify for these middle skill jobs. The need for middle skilled workers is apparent in several important industries right here in King County: the Seattle Jobs Initiative projects that there will be shortages of hundreds of workers to fill openings in teaching, nursing and computer support in the coming years, for example. In order to fill these positions, employers are joining forces with community partners to connect adults with the skills they need to be successful. Community colleges have proven to be particularly effective partners in workforce development efforts locally, and across the country. Through the Office of Economic Development’s investment in the Seattle Colleges’ Center for Working Adults, (CWA) the college is working to ramp up its capacity for public-private partnerships. For employers, CWA represents a pivotal partner for talent recruitment, retention, and advancement. Seattle Colleges have a legacy of developing effective employer-training partnerships. For example, Vigor Industrial is the leading provider of shipbuilding, complex fabrication and ship repair and conversion in the Pacific Northwest and Alaska; they need welders. South Seattle College leases training space from Vigor, administers a welding program, and pays instructor salaries. Vigor currently hires about 50 percent of the students into welding, fitting, fabricating, and other trades positions, and has a list of other employers that other grads are often referred to. An entry-level employee can expect to make an average of $21 per hour as a pre-apprentice. As a recent report from the Seattle Jobs Initiative details, local private-public partnerships in job training, like Vigor’s, are a win-win-win situation for all parties involved. Colleges improve the quality and relevance of their training programs, students improve their employment prospects, and employers secure a pipeline of workers who have the specific skills they need. Participating in job training programs saves businesses money. The Seattle Jobs Initiative’s study of Shoreline College’s program, for example, found that businesses saved thousands of dollars on both training and labor costs. Partnering with community organizations is especially helpful for small businesses, which are less able to shoulder the costs of training staff on their own. The Office of Economic Development continues to support partnerships that bridge the skills gap between workers and employers. Have questions or ideas? Reach out to us at oed@seattle.gov. Thousands of youth were offered employment opportunities with private and public sector employers across the city through Seattle’s Youth Employment Initiative in 2018. The program has provided 9,624 paid internships for low-income and marginalized young people in the past three years. To support the effort, JPMorgan Chase awarded the City of Seattle $100,000 this year to fund youth internships and the City’s program that helps recruit employers. With this year’s donation, JPMorgan Chase has now donated $1 million over the last five years. As a first-time funder this year, Bank of America joined the City’s youth employment efforts and invested $50,000 in support. Bank of America also supports the initiative through employing interns at a number of Seattle-based financial centers. Swedish Hospital contributed $30,000 to host interns at its offices this year. Other donors include the Cruise Industry Charitable Foundation, the Seattle Office of Arts & Culture, Google, and the Seattle Music Commission. Through the Youth Employment Initiative, eligible youth and young adults are connected with paid work experience in positions at various City departments and other public and private sector placements based on their career interests. The City is also collaborating with partners to provide other creative career exploration activities for young people, where students have the opportunity to learn about potential jobs and network with employers and workers. Youth employment provides skills necessary for young people who otherwise would be left out of the labor market and has been shown to have positive effects on lifetime employment, earnings, and net worth. Internships also help young people build a network of caring adults, practice employment skills in a supported environment and connect their education to career goals. This is particularly critical for marginalized and low-income youth, who may lack family or community networks to help guide them towards a successful career. Last year, over 3,000 local youth were employed at organizations and companies across the city through Seattle’s Youth Employment Initiative. This year we expect to serve approximately 4,000 youth. For employers who are interested in working with the City of Seattle to help young people reach their full potential, reach out to oed@seattle.gov.